I know it’s difficult, if not just plain foolhardy, to judge a project on the strength of 53 seconds of video specifically designed for the very purpose of getting you excited about said unmade project, but what can I tell you, I’m a sucker for lightning powered boys and their water/ice powered blue cat buddies. Which is fortunate as Alexander Snow’s proof of concept teaser for animated series Koji delivers that alongside a host of colourful characters bound for great adventures. Before I spoil an already scant peek into the world of Koji, take a look at the ID piece below, after which Alexander graciously takes us through Koji’s various iterations from comics to animation, and his plans for expanding the universe into the realms of TV and film. Although Koji comes very much from your imagination this concept film is presented by Wolfbat studios. Who are your core collaborators and how did you come together to form this collective of multi-platform storytellers? It’s a long story but Koji was an original idea I’ve been developing for about 3 years now. I started off attempting to make a comic in hopes to someday use that comic to help pitch it as a film or TV show. I figured it would be a fun process where I could learn a lot and in the end have a comic made which is a big deal to me since I’ve loved comics and graphic novels since I was little. As schedules and other obstacles caused the comic to pause for an indefinite time, I decided to use what I had done so far to begin to build a network of artists I enjoyed working with. I had already designed the characters and had a good idea of the story so I hit the internet, mainly sites like DeviantArt and ArtStation and began reaching out to artists. I tried what felt like every style possible with a ton of extremely talented people and ended up really gelling with a handful. Once I met Gop Gap (GG) we really clicked. We began nailing down the characters and style and I began getting the story much tighter and focused and preparing a pitch book. It wasn’t until I was trying to describe Harper’s axebow, or Koji’s teleportation, that I realized a book or explanation doesn’t really pack the excitement I had in my head. I had had an animation test done in 2D by the crazy talented Jeffey Lai and now that the characters and style had been nailed down I wanted to revisit the animation realm. As a professional animator myself, how could I resist? From there I just kept wanting to push it more. At first it was a shorter clip, then longer but just lines, then I wanted it color, then I wanted it to capture the painterly look of GG’s art, and eventually it got us to here. Wolfbat Studios is a company a few of my super talented friends and I dreamed up after going to ComicCon in 2013 together. We wanted a place where we could work on our own stuff, or work together using our different skill sets and connections to the industry, to bring high quality work to the world with a foundation of strong storytelling mainly in the animation medium. Having already put in the work for a few projects, we decided that although this project was developed by me, it would be nice to launch it under the Wolfbat umbrella and let people know that we are a team of talented individuals, with different expertise, that can create original content or client projects at a top level caliber. How did first expressing the story in comics’ sequential form of pages and panels inform your approach to the animation? I wish I had been able to finish the comic with the original collaborator Daniel Alexander but unfortunately it was during the time Venezuala was going through the toughest time and he had to take care of himself and his family. I later attempted to do a few pages with Claudie Scott who did a wonderful job, but her schedule restricted us from going any further. I was able to go for a much looser look and get the first issue of the comic completed with Sai Foo but with the intention of using it as a pitching tool and outline for a pilot episode instead of hoping to release it as a professional comic. I think doing it as a comic is almost like doing storyboards or an animatic, but because of the restriction you have with pages and panel count you are forced to really focus in on what the important moments are and how to make them clear to the reader. The pilot is very emotional and sets up the entire series, yet it doesn’t have a lot of dialogue. Doing the comic made it very evident what was working and what wasn’t on both a storytelling and emotional level. You’ve spoken about the importance of creating a narrative which isn’t all surface and dazzling action, what are some of the deeper themes you plan to address through the series? Don’t get me wrong, action and cool powers and epic battles are big part of Koji, but the important and good stuff is all between the fights. It’s a very character heavy series with each character having their own personal arc. Even in the fights their characters will shine through in how they work together, or don’t, or if their emotions get the best of them. The main theme I would say boils down to two things. One is brotherhood and what that means to Koji. And the other seems to stem from the fact that Koji is adopted. 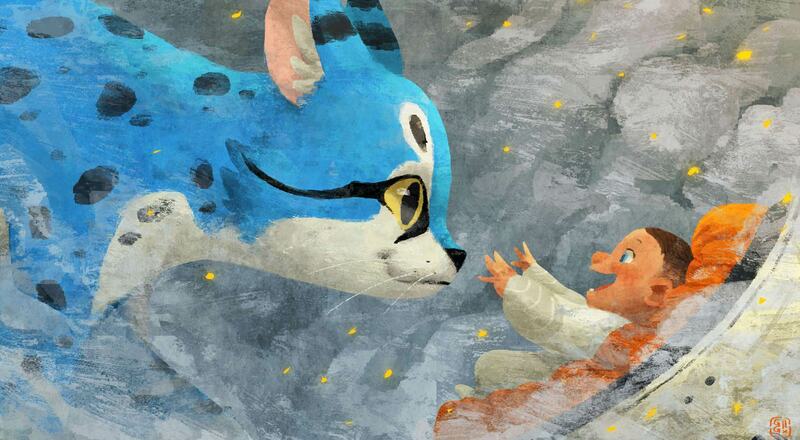 He arrives on the planet as an infant and is raised as Tako’s (the big blue cat’s) brother. They get along great, but under the surface Koji is always searching to understand his place in the world, as a person, brother, hero, and more. There isn’t too much in media that explores the topic of adoptive relationships and brotherhood and as the story developed something clicked that made everything fit into place. Character is everything to me, and I wanted to make sure that every character had a reason for being there. Although that’s the case for Koji, a character like Harper is much different. Her story is one that explores revenge, redemption, self growth, and tough choices and the reasons to make them. Character is everything to me, and I wanted to make sure that every character had a reason for being there, as well as a journey to take individually, while being part of the team journey. As far as tone and the balance between action and story/character development, I’m striving to create something as spectacular as Avatar:Last Airbender. I’m a huge fan of that series and to be comparable in caliber to a show like that is my dream. Koji has a much more painterly style then your studio work, what were the reference points you drew from when developing the look of the characters and world? There’s a post-credit tease of a 3D rendered Koji – is that a visual direction you’re considering? 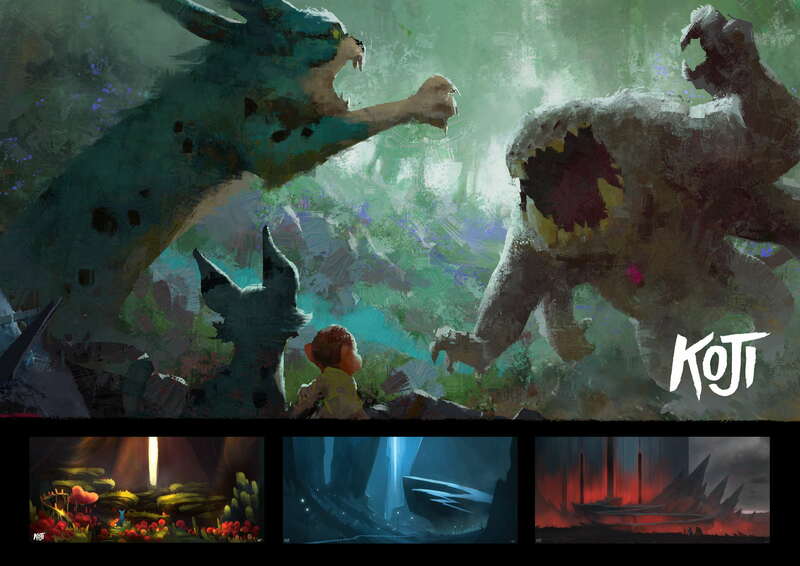 The painterly look all comes from the concept work done by GG. It’s his style and part of what drew me to him. I haven’t seen a lot of that style done in animation, and very rarely with action sequences or fluid top level animation. Once I considered doing the piece in color, there was no choice but to strive to bring GG’s work to life. Thanks to Linda Bjurhager, Amanda Holm, and Allan Michaut, the impossible became a reality. I was really nervous about the style in motion feeling too jittery and being unwatchable, but they literally made what was in my head come to life and I can’t thank them enough. As far as the piece at the end goes, I decided to do this mainly just to prove that it still works in 3D. I know a lot of studios see 2D and immediately turn and run, so I wanted to make sure I included some proof that Koji can work in multiple mediums and still be cool. I figured there is a good chance that someone will repost the video without giving me or anybody any credit so I also wanted to make sure that no matter where it was posted both styles were seen as proof of concept, and my contact info was on there for anyone who wanted it. Unfortunately since it happened after the main piece was finished, we ran out of time to fully develop the CG look. Although I’m really pleased with how it turned out, if we were going to make the series in CG I’d like to attempt a few ideas I have in my head to make the character feel a bit more like the painterly style. We did have time to incorporate the 2D FX with the CG and I think that couldn’t have turned out better thanks to Linda and Mathew Kiefer. 2D FX always blow me away, so it was a must have to figure out a strategy to get the two to work together in an awesome and appealing manner. What was the production process which enabled you to complete this proof of concept ID piece on a shoestring budget and in a relatively short amount of time? Luckily I had an absolutely amazing team and by the time I decided to do the piece, I knew the characters and what I wanted to show off about them, as well as all their designs completed. I had been searching for a 2D animator who could handle the complex camera moves and action I imagined and I had found an ID piece for the Guardians of the Galaxy show that was similar to what I was looking to achieve. I searched and searched for someone to take it on and everyone was either busy or didn’t feel up to the challenge. Always wondering who even animated that Guardians piece, I by chance stumbled upon the animator’s reel and immediately reached out to him. Teaming up with Maxime Delalande was the absolute best decision I made for this and I cant imagine having done it with anybody else. We immediately clicked. He understood exactly what I described to him and addressed all notes I gave, like the champion he is. If Koji moves forward I would absolutely need to keep him involved because of how fun he was to work with and how proud I am of the piece we were able to create together. After the 2D is just the coloring team mentioned above, Noah Woodburn knocking the sound design out of the park, and The Electric Sons being amazing as usual with the music. The CG was done thanks to a great model by Pedro Conti, and awesome rig by Calle Halldin, great animation by Matt Walker, textures by GG and Henrik Karppinen, and compositing and lighting by Matt Keifer. We did the whole piece in about 3 months, but it could have been even faster if we weren’t all working professionals with jobs that take up most of our days, as well as not having any of the CG assets ready for animation prior to starting. We used TV Paint, After Effects, Premiere Pro, Maya, Nuke, and Photoshop to create it and the production was just sharing Google drive folders, sending emails, and for the CG animation, we used a fantastic site called SyncSketch to do draw over notes and critiques. The pitch book is an essential tool for presenting a project to potential financiers. Could you discuss what went into the Koji pitch book? Just like everything in this project I was attempting to do everything for the first time. I researched a bunch of pitch books and show bibles and tried to pick out what was important for the reader. Is there enough there with either art or short simple explanations that you can get a feel for the show very quickly if you wanted, but then also enough in there to really dive deep? I think finding that balance was the toughest part, along with discovering the layout and what worked. Luckily for the layout/graphic design I had the super talented Pablo Hernandez who actually designed the Wolfbat Logo for us shortly after ComicCon as sort of a promise to ourselves that someday we would form the studio. With the book it’s also very important to know what you are trying to make. Is it a movie, a TV show? Are you dropping the book off and leaving or are you going to also be presenting a pitch? For me I decided to structure the book aiming to show its appeal as a TV series and also make the book with enough info that anybody could pick it up, read it, and know everything they needed to know. I’m not hiding spoilers or building suspense, it’s the information presented in a professional grammatically correct way, with lots of art and organization that makes it easy to understand and digest. For me the table of contents would be: Cool cover image, Logline, Overview, Character Bios, Potential Episode Ideas, an outline for all 3 seasons, about the director/creator page, and some extra artwork to end on a visual note with my contact info on the back. Now the proof of concept film is out in the world, ideally how would you like to see Koji progress? The goal for Koji is to make it into a TV series or film. Now whether that is online, or streaming or on network TV, it doesn’t really matter to me as long as the story is being told and the characters are coming to life with the high quality I expect and strive for. To achieve that we’d definitely need an investor or some sort of financial support. Depending on how this is received, I think the next definite step would be to lock down a style and commit to it, and create a legit trailer for the series. This piece is just an ID to show you the characters, their powers, and the fun of the show and the world. So the next one would be more of a trailer you expect to see for a film or TV series, showing actual moments from the first season/film. For that I’ll be using a fantastic site called Artella to try to build a team and keep all the assets organized and professional. I’ll also be considering going down the crowdfunding route to have the proper funds to accomplish the goal and keep the quality at the level it deserves. Are there any other projects from Wolfbat Studios we should be on the look out for? We have a ton of ideas for shows, apps, games, films churning around in our heads but the two that are furthest along are Kitty Wizard and Luther Strode:the animated series. Both are on the site but expect updates for Luther in the new year. For that we are attempting to get a pitch together to show how awesome Luther Strode would be as an animated mini series for a streaming service like Netflix, Amazon, Hulu, YouTube Red, etc. Luther Strode is a fantastic series published by Image Comics, made by Justin Jordan, Tradd Moore and Felipe Sobreiro. It’s 3 volumes made of 6 issues each, all available right now anywhere you would normally get comics. The goal would be to do the mini series in the same format (3 seasons, 6 episodes each). It would be rated R, or at least pg-13, and help push the medium and the possibilities achievable by animation in a similar fashion as anime, Sausage Party and The Goon (crossing my fingers for this one) have all done.